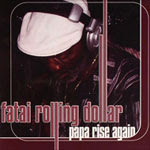 This 13-track recording Papa Rise Again is a moving testimony to a man resuscitated from the dead only four years ago. For 20 years, Fatai Rolling Dollar had been Fatai Olayiwola Olagunju, the anonymous security guard in a stadium. When the musicologist Steve Rhodes tracked him down, he was down to his very last dollar. The fairy-tale renewal with the Agidigbo player is powerfully encapsulated in this vintage album. It revisits the songs at the heart of Fatai’s glory years and mixes them slickly with his latest compositions. The variety in the composer’s music style chronicles the influences that have washed through Nigeria since the Fifties. The native Agidigbo style is at the heart of the work, of course, and it crystallises beautifully with palm wine highlife in the title track or “Awa Re Koja”. But in “Eraya” we also enjoy transatlantic blues in this homage to the legendary songwriter Ambrose Campbell; Lagosian folk music in Fatai’s take on “Baba Wa”; Latin American melodies in “Orona”, and its Creole-spiced lyrics. Such a far cry from the abject poverty of the one bedroom hovel he was living in after his destitution in 1977. That is where he lived with his wife and five children, before illness and abject poverty took them all. The pain and suffering he endured remain surprisingly absent from this icon to Nigeria’s traditional urban music. “I am like a tiger and all my body is ready for action,” he told a reporter shortly after the release of the three albums that marked his return in 2004. Papa Rise Again oozes with nostalgia. But the album’s raw percussions, slick palm wine guitar licks and modern production techniques give it a timeless quality that will warm hearts of all generations. There is a gentle defiance here that is reflected in Fatai’s live performances, as his upcoming tour of Europe will undoubtedly prove. whoa! the new look caught me off guard there! thanks for the Rolling Dollar article, though... i'm glad to hear that he's doing okay, because he was in pretty dire straits even after his well-received comeback a few years ago.